A real-time display of water use to turn your morning shower into a water-saving battle. There is nothing like introducing a little competition to get people to change their behavior. No one likes to lose. 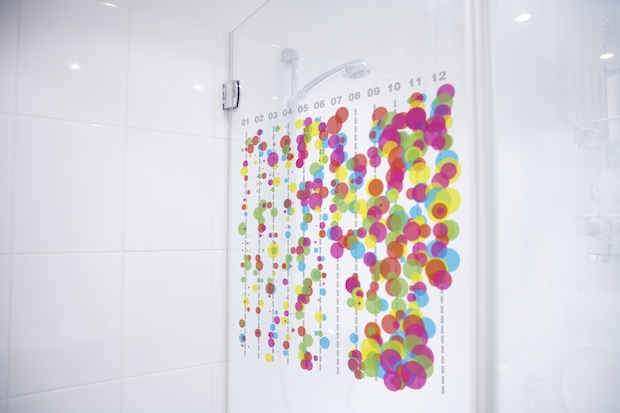 That’s why the Shower Calendar, a Finnish project prototype, is so fun. It would let you track your shower water use against everyone else you live with while in the shower. Don’t want to lose the water conservation game with your roomies? You have to turn off the shower. It’s great that the program would let you take a shower for as long as you want (if you want to do more than 60 liters, you get just a tiny dot). People are much happier limiting themselves than having limits forced upon them, and nobody likes to lose. We’ve seen this work both in groups, like the Tidy Street project, where neighbors posted their electricity usage on their street, and alone, like in services like Mint.com, which uses extra data to help you save money. The only thing keeping you from using water with the Shower Calendar is your own pride. One amusing note: Sixty liters is 15 gallons. The average U.S. shower uses 2.5 gallons a minute. In a great illustration of the differences between American and European ideas about water, the Shower Calendar considers a six minute shower “long.” We may have to adapt that to America or our calendars would be only tiny dots.